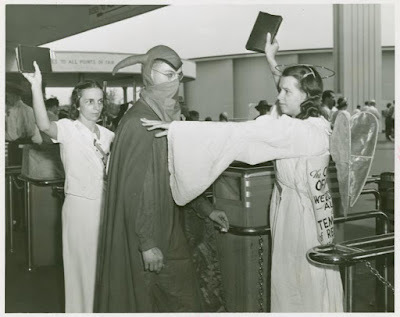 A man dressed as Satan is play-assaulted by two Bible-weilding women, one of them dressed as an angel, as he tries to enter the 1940 New York World's Fair. It is not clear why. The picture comes from the Manuscripts and Archives Division of The New York Public Library.